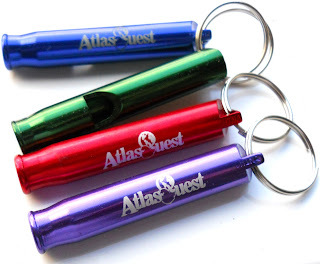 Atlas Quest: Get Your AQ Whistles! blue, green, red, and purple. A long, long time ago, way back on April 4, 2011, Housepitality Hostess posted to the message boards suggesting an AQ whistle for premium members. I liked the idea of a whistle--it's considered one of the ten essentials by many people and can help in an emergency when cell phone coverage is weak or spotty while out beating the trails in search of letterboxes. I saw no sense in restricting them just for premium members, but I liked the idea of an AQ whistle. So I poked around, looked up several companies that could create custom whistles, got some prices, and decided, hey--this is doable! So I ordered them, and 100 bright and pretty whistles arrived this afternoon. Amanda grabbed a green one for herself, blew into it, and I can assure you--these things really work well! I ordered 25 in each of four different colors: red, blue, purple, and green. And they are now available for sale in the AQ Marketplace! If you want one, order yours today! Once I sell out, I'm not sure if I'll order more or not. I guess it depends on how popular they are. I definitely won't be ordering more until I'm running low of all colors--so if you have a favorite color that sells out, there won't be more coming until maybe all of the other colors have sold out as well. "They've even been known to scare off moose!" Sheesh, I'm not even safe in the Marketplace! YAYYYY! I'm so STINKIN' EXCITED! I let out a LOUD YAHOOOOOO here at work! Hopefully no one heard me! Please sign me up for a RED one!! Blessings and THANK YOU SO MUCH! I'd like to order 2 purple whistles as well! Where do I send the check? Holy smokes! Good thing I ordered last night and didn't wait to think on it a while! Impulsive purchases can be a good thing! I DIDN"T EVEN GET TO ORDER ANY!!!!!!! I bought the pencils and eye bleach patches... I WANT SOME WHISTLES TOO!!!!!!!! I just realized that I posted that I'm "not" out of purple and red. It was supposed to say "now"! hee hee hee! Just stirin' the pot! P.S. Anyone else out there want ANY of these?! C'mon? AnyBODY! ?